Since its original inception in 2009, this podcast has produced consistent quality material at no cost to the listener. Due to the immense and enthusiastic fan base this show acquired over the years and as we realize the resource the show has become for so many of you in the Pagan and Witchcraft communities, we have decided to increase our involvement in the content we are producing. After suffering a technology crisis in October of 2016, we also realized exactly how fragile the show is. Chris' computer, the main hub of our recording and producing, went completely down, which could have completely halted the production of the podcast if we were unable to address it on our own- perhaps even indefinitely. Thankfully we were able to quickly address it, but not in the way we would have preferred and this incident made us realize that there was a serious need to establish a consistent level of financial backing to the show in order to insure that it continues to serve the dedicated audience it has developed over the years. This page, our Patreon, will also help us to not only solidify the show's continued future, but to also create the opportunity for us to give back to you, our listeners, while also raising the status of the show in our lives to being something beyond the hobby it started out as. Up until now, we've pushed things along as much as we could given our available resources and now with your help and support via Patreon, we hope to push even further and have the backing to carry the show to ever greater heights! To help the show grow. To help us pay for regular show expenses- such as Libsyn hosting fees, domain and website fees, and a PO Box for the show, so we can get start to receive mailed correspondence from all of you! We also have monthly program subscriptions, like Adobe Photoshop and Adobe Audition, which go towards show production- but, we'd also like to begin offering additional content such as show graphics, flyers, t-shirt designs, printable items, stickers, course materials, etc. To help us in purchasing music for the show. Not all artists provide us with music and some need us to buy their music. While this is completely understandable and we are more than happy to support them, doing so does create an added show expense that has previously come straight out of our pockets. To help us purchase extra books and music to use as contest prizes- exclusively for the Patreon supporters. To help us provide you with more content on a regular basis. Extra money means extra time to plan, prep, and work on the show. To help us consistently upgrade our equipment and our recording setup to insure continued production quality and content. As we learned in October 2016, when the whole system went down, you can't schedule an emergency! To permit us the opportunity and time to explore additional media or technology such as books, online classes, videos, etc. to ultimately provide you with even more enjoyable and valuable content. To help contribute to travel expenses, so that we may attend more events and gatherings to meet all of you in person! There are so many fantastic conferences and conventions every year that we miss because we are currently limited to only one or two a year that we can drive to in a few hours. As time goes on- we may also offer other exclusive rewards and materials to our supporters or even open additional reward tiers that include things like official DatC t-shirts, tarot readings, or magickal items that we've crafted ourselves! Our undying gratitude and appreciation- by contributing, you let us know you care about what we have been doing for you and the Pagan and witchcraft communities. Thank you! Access to our monthly Patreon update post so that you know what's going on with the show on our end. Updates may include information not shared on social media outlets, such as the direction of the show, scheduled and potential future guests, plus other good stuff! 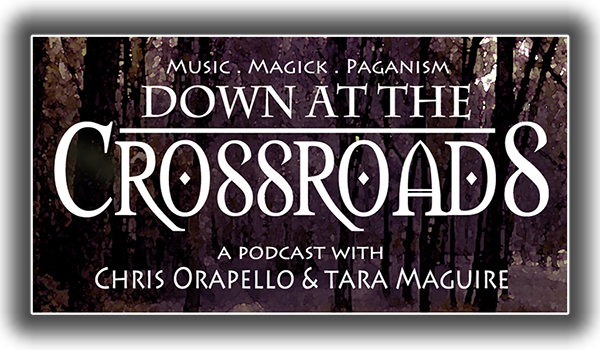 Plus an exclusive Down at the Crossroads Podcast graphic for your computer desktop. After 3 months of continued support- a snazzy DatC Podcast refrigerator magnet, which will totally make your friends and their refrigerators so jealous! Episode after-parties we've recorded with our guests! We've been recording additional interview content (at least 10-20 minutes in length) that will be released approximately each month on Patreon, exclusive to the supporters in this reward tier and above. Automatic inclusion in exclusive random Patreon contest draws that may contain books, CDs, DVDs, or other show-related giveaways! After 3 months of continued support- you will also receive a fabulous DatC mug with our show graphic emblazoned upon its side. This mug will guide you to the Underworld and beyond as you drink your morning caffeine fix! Monthly live hour-long video chat with Tara and Chris. More goals will be added as we move along, but this is our first!